Since inception in 1996, the MOBO Awards has become one of the biggest Music Award ceremonies in Europe. This exceptional event has seen continued growth, and played host to many global artists over the years, including Janet Jackson, Jay Z, Rihanna, Tinie Tempah, Usher and Amy Winehouse, to name a few. The awards focus on recognising the achievements of exceptional talent in the musical fields of Hip Hop, Grime, RnB/Soul, Reggae, Jazz, Gospel, and African music. With an expected audience of up to 10,000 people and numerous VIP guests, it was essential that event staff had uniforms that would stand out. 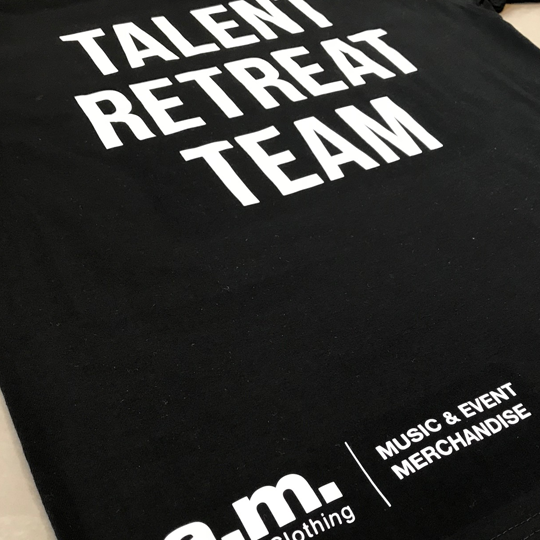 As specialists in music & events merchandise, A.M. Custom Clothing were selected as an official supplier of branded uniform. Our experienced team, helped to design and deliver printed t-shirts, to serve as uniform for the events staff. The bold white prints ensured team members stood out from the crowd and were easily recognisable as staff members. Through the use of industry leading technology and a responsive team, we were able to meet all of the requirements. We delivered with an extremely rapid turnaround and without any compromise on quality. Additionally, all of the products were ethically accredited by the Fair Wear Foundation, ensuring the highest ethical standards.